But now thy (Saul's) kingdom shall not continue: Jehovah has sought him a man after his own heart, and Jehovah has appointed him (David) ruler over his people; for thou hast not kept what Jehovah commanded thee. (1 Samuel 13:14). Why would God put such a high affirmation on this man? How can I have a heart after God's sacred heart, like David had? David was anointed as king by the prophet Samuel while he was still a teenager (although he did not assume the throne until he was 30). He was probably in his late teens when he slew the giant Goliath. Probably he wrote Psalm 23 and perhaps other psalms while he was still a teenager, watching his father’s sheep. The trials David went through at the hand of Saul occurred while David was in his twenties. So his life contains much instruction for those who are on the younger side. That’s especially important in our day when there is a common belief that teenagers are supposed to rebel. We expect it and it often becomes a self-fulfilling prophecy. But it should not be the norm for Christian teens. In Scripture, there are many examples, David being foremost, of young people with a heart for God. Sure, David lacked the wisdom of experience. He needed trials to refine and mature him. There were “sins of his youth” that he later would regret. But God began to use David in a significant way while he was still in his teens. He can still do that. 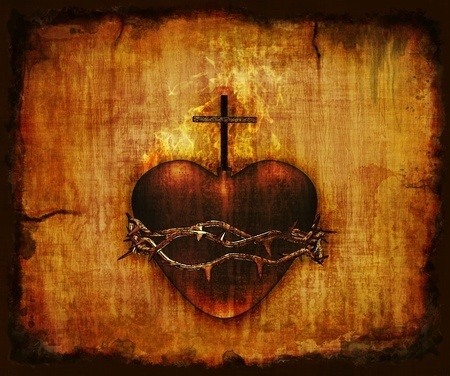 1.To have a heart after the sacred heart of Jesus, we must be converted. It is most crucial at the outset to establish the fact that David was not by nature a man after God’s heart. He did not possess some inherent goodness which made God choose him. In Psalm 51:5 David declares, “For behold I was conceived in iniquities; and in sins did my mother conceive me. ” Every person who is converted recognizes that there is nothing in himself which commended him to God. By nature we all are sinners, in rebellion against God. We all are self-willed and self-seeking rather than seeking after God. No one deserves anything but judgment from God. And David was not made right before God by his own good deeds. In Psalm 32:1-2, David wrote, “Blessed are they whose iniquities are forgiven, and whose sins are covered. Blessed is the man to whom the Lord hath not imputed sin, and in whose spirit there is no guile. ” The Apostle Paul quotes these verses in Romans 4:7-8 in the context of arguing that no one is made right with God by their own good works. Rather, it is by sanctifying grace through faith in God’s provision for our salvation. So we would be off on the wrong track from the start if we assumed that David, by his own will power and effort was a man after God’s heart and that God chose him on that basis. Even so, God chooses those whom the world would reject, so that none can boast before God. Although David had his share of sins, he always confessed and turned from them, he was honored by God. There are a number of tests of whether faith is genuine or spurious ( read the whole book of 1 John): A truly converted person will have a growing sensitivity to and turning from sin (1 John 1:5-10). He will be growing in obedience to Christ and in love for His people (1 John 2:1-11). He will have a growing knowledge of and love for God’s truth (1 John 2:21-27). In short, he will be learning to turn from self-seeking and instead to seek the things of God (Luke 9:23-24). One further thing: A converted person will not be apathetic about the things of God. Those who are complacent do not see their great need for God. But God says that such people do not know their true condition, that they are wretched, miserable, poor, blind, and naked, and that He will spew them out of His mouth unless they repent (Revelation 3:15-19). 2. To have a heart after the sacred heart of Jesus, we must be Spirit-filled. Note 1 Samuel 16:13. Before Pentecost, the Spirit of God did not permanently indwell all believers as He does in the present age of grace. Rather, He came upon certain ones to enable them to perform certain roles or tasks. He also could and did leave those who did not walk uprightly (1 Samuel 16:14; Psalms 51:11). When Samuel anointed David for the throne, the Holy Spirit came upon him mightily from that day forward. David was a markedly different young man because of the Holy Spirit. If you are truly converted and been baptized, you have the Holy Spirit indwelling you. But you are not in the flesh, but in the spirit, if so be that the Spirit of God dwell in you. Now if any man have not the Spirit of Christ, he is none of his. (Romans 8:9). But you also need the filling of the Spirit, the power of the Spirit. That begins with the sacrament of confirmation. But if you’re tolerating sin in your life or are living to please yourself rather than God, you are quenching or grieving the Spirit. You must through the sacrament of confession make known all known sin and yield consciously and continually to the Holy Spirit so that He will produce His fruit in your life (Galatians 5:16-23). A good question to ask is, “If the Holy Spirit were to withdraw his working in my life, how long would it take me to miss Him?” Am I so routine, so self-dependent, that I could go on for weeks and never realize that the Spirit had departed? Also, we need to be careful to realize that the prime mark of a Spirit-filled life is not miraculous signs and wonders, but rather the fruit of the Spirit (Galatians 5:22-23) and joyful endurance in times of trial (Colossians 1:11-12). To be a man or woman after the sacred heart of Jesus, we must be truly converted and we must walk daily in dependence on the Holy Spirit. 3. To have a heart after the sacred heart of Jesus, we must spend time alone with God. David was out in the field with his father’s sheep when a messenger, out of breath, came running up and said, “The prophet Samuel is with your family and he wants you to come!” So David went and to everyone’s bewilderment, Samuel anointed David (1 Samuel 16:1-13). I doubt if anyone except Samuel understood at that time the full significance of that act. But they knew it meant something. Then Samuel went back to Ramah (16:13). And where did David, the newly anointed king, go? Back to his sheep (16:19)! And what did he do out in the fields with those sheep? David used that time alone to develop his relationship with God. If you’re married with children at home, you probably will have to fight to make time to spend alone with the Lord. If you’re single, you’ll have to fight to use the time you have alone for spiritual growth rather than to yield to temptation. For a very large part of my life, I was alone. I spent years traveling from town to town opening up new stores for the company I worked for. I worked almost everyday, seven days a week, so I did not even have a parish to be involved in in most cases. I had a lot of alone time in wicked cities where I knew almost no one else. I easily could have fallen into sin and nobody would have known. I had to commit myself to use that time to seek the Lord. On what days I did have off my I used to take a spiritual book, my rosary and my Bible, and drive over to a cemetery or nature reserve near me and pray and read for several hours. It was a lonely time, but I look back on it favorably because it was a time of growth in the Lord. 4. To have a heart after the Sacred heart of Jesus, we must be obedient in small things. When we first encounter David, he is tending his father’s sheep, a job his older brothers looked down on (1 Samuel 17:28). David’s father didn’t even seem to consider David important enough to be included at the big event with Samuel (16:11). But God saw David’s faithfulness in this seemingly unimportant task. It was part of his apprenticeship for leading the nation (Psalms. 78:70-72). He took his job seriously. When a predator attacked one of the sheep, David didn’t shrug his shoulders and say, “Oh, well, I’m not going to risk my neck for that dumb sheep!” He went after it and rescued it ( I Samuel 17:34-35). Later, Saul heard of David’s skill as a musician and summoned him to the palace. I’m sure that as David played his harp out in the fields, he never dreamed that it would someday open the door for him to play before King Saul. But, when it did, David served well in this more important task (1 Samuel 16:14-23). Then came war with the Philistines. David’s older brothers joined Saul on the battlefield. But where was David? Back tending his father’s sheep again, and serving as errand boy for his father ( 1 Samuel 17:14-15). When Jesse wanted David to go find out about his brothers’ welfare, he carefully made provision for his shepherding responsibilities and obeyed his father without complaint (17:20). Do you want God’s supreme compliment applied to you one that says that you are a person after Jesus's Sacred heart? Make sure you’re truly converted. Depend consciously each day on the actual grace that flow through the Holy Spirit. Spend time alone with God often. And, practice obedience in the small things He gives you to do. That’s how God developed David from a shepherd boy to a great king. Every person who has a heart after Jesus's sacred heart must walk the same way.